^ The Programming Languages Beacon, v10.0. 2010-02. ^ 3.0 3.1 3.2 3.3 Windows CE/Windows Mobile Versions. pocketpcfaq.com. [2007-09-06]. ^ De Herrera, Chris. More Than a PDA! 互联网档案馆的存檔，存档日期2008-08-21.. Pocket PC Magazine. Retrieved 14 September 2007. ^ Morris, John; Taylor, Josh, Microsoft jumps in the all-in-one game, zdnet.com, Retrieved from the Internet Archive 6 September 2007. ^ Announcing the New Pocket PC 2002, Microsoft, Retrieved from the Internet Archive 6 September 2007. ^ Gray, Douglas. HP to unveil Jornada 560 series of handhelds 互联网档案馆的存檔，存档日期2007-07-14.. ITWorld.com. Retrieved 14 September 2007. ^ Gray, Douglas. Palming new handhelds: Pocket PC 2002 互联网档案馆的存檔，存档日期2007-10-22.. CNN. Retrieved 14 September 2007. ^ De Herrera, Chris. The Pocket PC 2002 Gets More Features for Work and Play 互联网档案馆的存檔，存档日期2007-10-11.. Pocket PC Magazine. Retrieved 14 September 2007. ^ De Herrera, Chris. Windows Mobile 2003 互联网档案馆的存檔，存档日期2007-09-14.. Pocket PC Magazine. Retrieved 14 September 2007. ^ New Mobility Features in Exchange Server 2003 SP2. Microsoft Technet. October 2005 [2007-06-04]. ^ Boulton, Clint. Microsoft Looks to Mobilize With Exchange SP2. internetnews. October 19, 2005 [2007-06-04]. ^ Windows Mobile 6 press release (新闻稿). Microsoft. February 7, 2007 [2010-10-13]. （原始内容存档于2007-03-10）. ^ Langridge, Jason. Differences between platforms. Microsoft MSDN blogs. （原始内容 (png)存档于2007-02-27）. ^ Langridge, Jason. 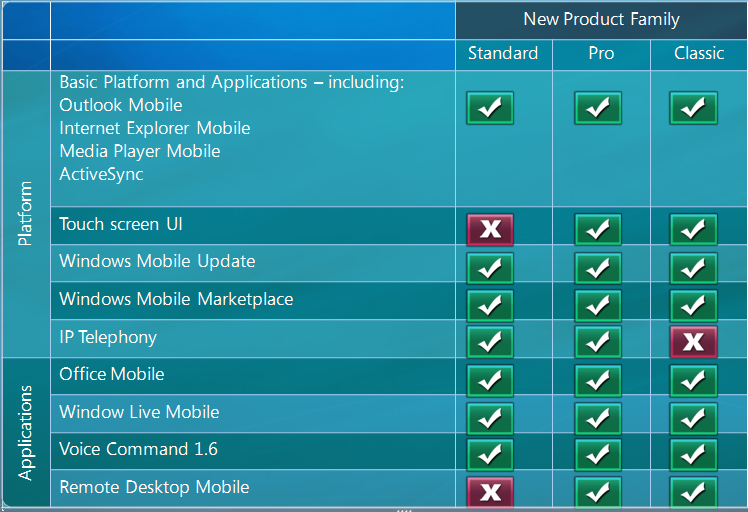 Summary of Windows Mobile 6 Specs. Microsoft MSDN blogs. February 8, 2007. ^ "Image Gallery: Windows Mobile 6 Professional screenshots, Windows Update, screen 1" 互联网档案馆的存檔，存档日期2007-02-14.. ZDNet. Retrieved 10 October 2007. ^ Improved Remote Desktop access 互联网档案馆的存檔，存档日期2010-03-17. ^ Windows Live. [2010-10-13]. （原始内容存档于2007-10-15）. ^ Microsoft Press release. [2010-10-13]. （原始内容存档于2009-02-03）. ^ Ballmer confirms Windows Mobile 6.5. （原始内容存档于2009-06-20）. ^ Windows Mobile: What’s coming when - All about microsoft - ZDNet.com. ^ 26.0 26.1 Motorola Delays Cell-Phone Spinoff, Drops Platforms. ^ Browser: Microsoft's Internet Explorer Mobile 6 aka 6 on 6 is real and shows its face. ^ Windows Mobile 6.5 walkthrough with Engadget（now with video!）. ^ Microsoft My Phone beta - Microsoft. [2010-10-13]. （原始内容存档于2009-02-16）. ^ Microsoft announces Windows Marketplace and My Phone for Windows Mobile. ^ MWC: Your Definitive Windows Mobile 6.5 Post-Release Guide - Pocketnow. ^ Zune services coming“this calendar year” - Wmpoweruser.